Firefighter Survival/ Mayday Training - This 2 day program is designed for both novice and the most seasoned firefighters to challenge them both physically and mentally. This course will give you the skills you need to rescue both yourself and others. 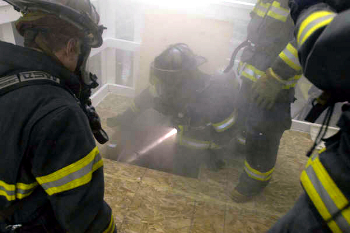 NFPA Indiana (IDHS) firefighter certification courses: HazMat & Technical Rescue also available. Makes firefighters aware that the second leading cause of firefighter line-of-duty fatalities is becoming lost, caught or trapped on the fireground. Illustrates how the disorientation sequence plays a role in firefighter fatalities. Illustrates the importance of fireground accountability. Introduces the Mayday Protocol and the parameters for declaring a Mayday. Teaches basic survival awareness by discussing fire dynamics, building types, the warning signs of collapse and the types of collapse. Teaches sound search and rescue techniques. Teaches size-up and search techniques for rapid intervention. Teaches tactical considerations when switching from suppression strategy to a high-priority rescue. Teaches the importance of a strong command presence and managing resources when a Mayday is called. Discusses considerations for developing standard operating procedures.